You are here: Home / Chapter 7 Bankruptcy / Car Repossessed Last Night? I Can Get It Back With Chapter 13. Car Repossessed Last Night? I Can Get It Back With Chapter 13. Imagine the surprise of getting up in the morning and finding that your car has been repossessed. Even worse, you may have been in the process of getting a chapter 13 bankruptcy case filed or you might have been thinking about filing a chapter 13 bankruptcy case to repay the debt on the car that you have fallen behind on. Before you think that you can’t be helped, remember that chapter 13 will allow for the recovery of a repossessed vehicle provided that the vehicle has not yet been sold at an auction. Let me describe a situation that happened to one of my clients last night. The client hired me to handle a chapter 13 bankruptcy case to save their vehicle from repossession. The auto finance company had been calling for several days inquiring as to when they’re going to make a payment. The client advised the auto finance company that they were filing chapter 13 bankruptcy through my office and they were given my name and number. Instead of realizing that the client was telling the truth, the auto lender went ahead and repossessed the vehicle anyway. Now although this will cause some initial hardship to the client, I will be able to get the car back and the debtor will be able to reorganize that debt over the next 3 to 5 years. A few things have to happen before I can actually file the case. First, the debtor must return the signed bankruptcy petition and schedules that were prepared for filing. The debtor must also complete a mandatory credit counseling session prior to filing. The debtor must also provide four years of federal tax returns and two months’ worth of paycheck stubs. These items are required under the bankruptcy code and need to be submitted to the chapter 13 trustee at least seven days prior to the meeting with the trustee. If the debtor can get all these items to me today, I can actually have the chapter 13 bankruptcy case filed immediately and the vehicle likely recovered within 1 to 2 days. 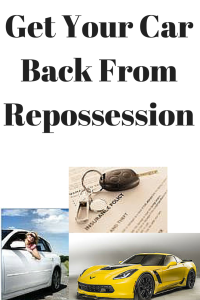 The key here is that you should not wait if you know that the repossession man is seeking to take your vehicle back. It is one thing to be in the process of a chapter 13 bankruptcy and quite another to actually have a case filed with actual legal protection. Under the legal case of Thompson, I am able to recover a vehicle by filing a chapter 13 bankruptcy any time before that vehicle is actually sold at auction. Since the vehicle was just repossessed last night, the debtor will not have any problem recovering that vehicle if we are able to file within the next several days. If you are struggling with your auto payment and are looking into reorganizing the payments under chapter 13 bankruptcy, you may contact my office directly at 847-520-8100. We have seven offices to serve you and we will be happy to answer any questions that you have without obligation.